Be the first to share your favorite memory, photo or story of Elias. This memorial page is dedicated for family, friends and future generations to celebrate the life of their loved one. 9th, 2019 at home surrounded by his family. Elias was born June 13, 2009 in Belfast, a beautiful spring day, to Bryan and Kelsey Menard. From an early age Elias developed a love for cars, trucks and tractors. By the age of 2 he could tell you the make of a vehicle just by looking at the emblem. He enjoyed spending time with his dad in the shop. He would help change oil and spent countless hours attaching chains and tow ropes to his toys and doing jack-ups with the engine crane. His obsession with driving began at the age of 3 with his “power tractor.” His power tractor brought him many hours of fun and he developed an appreciation for his newfound freedom and independence. As he got older, his collection of things to drive expanded to include two dirt bikes, a go-kart and a special blue (his favorite color) four wheeler he enjoyed during his last summer here. It was evident that Elias was most content just being able to ride around the fields here at home and through his secret spots on the stone walls. agreeable and excited for what might lie ahead, he simply loved it all! Chick-fil-A original -no pickles! or Five Guys grilled cheese) and just being with his family. exclaimed, “I’m never giving this baby up!” He quickly bestowed upon him the nickname Drewy and developed a love for his brother that was very evident everyday. He would proudly boast about his baby brother to anyone and everyone. 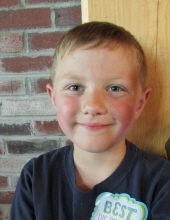 Elias attended Morse Memorial Elementary in Brooks from kindergarten through third grade. He liked to read and found laughs in reading Diary of a Wimpy Kid and joke books, he was also an excellent speller. He of course looked forward to attending all the special events at school. At Morse, he made many special friends, memories, and was adored by all. Elias was blessed with the kindest, sweetest soul and a gentle, sincere and pure heart. He had the most brilliant blue eyes, a beautiful smile and an unforgettable laugh. He would bring us “love rocks” that were specially selected by him from the driveway. He picked many flowers for his mom that were given with a kiss and never refused to hold a hand while riding in the car. He had no objections to lots of hugs, kisses and snuggles. He expressed his love for others by drawing many hearts and writing many I love you’s, he was the most lovable little boy. Elias is survived by his extended family and will be missed by all those who knew and loved him. To send flowers or a remembrance gift to the family of Elias Joseph Menard, please visit our Tribute Store. "Email Address" would like to share the life celebration of Elias Joseph Menard. Click on the "link" to go to share a favorite memory or leave a condolence message for the family.